Following her attendance at the Daily Front Row awards, Kiersey Clemons attended the 29th Annual GLAAD Media Awards at The Beverly Hilton Hotel in Beverly Hills, CA last night(April 12th). Serving up some leg action, she wore a LOUIS VUITTON SPRING 2018 black textured & leather panel jacket with contrasting white ruffle cuffs & neckline and black shorts. 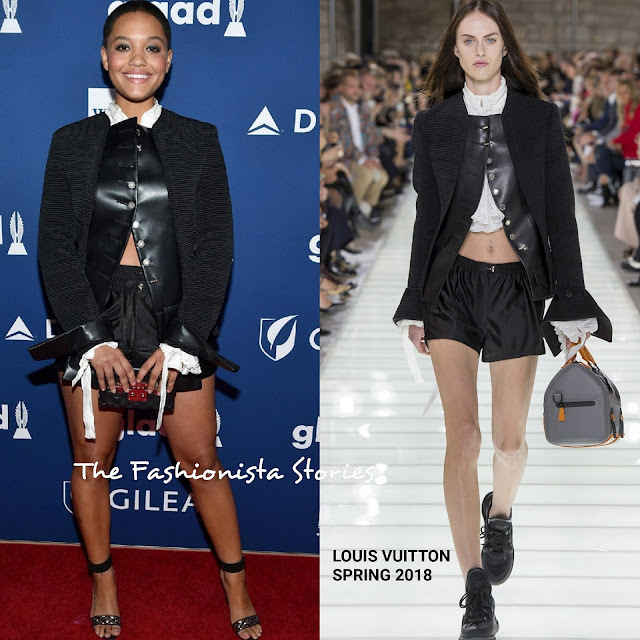 Kiersey also wore & carried LV accessories. My only quibble is that I wish the neckline was presented as on the runway but she styled nailed this look. A hint of midriff added a flirty appeal to her great look.